Size: 5� 3-5/8� Imprint Area: 3� x 1-3/4� Shipping Weight : 100 Pcs. / 20 Lbs. Waterproof, Includes Keychain For Neckrope Add.15 Other colors available in large quantity Size: 4-1/2� x 1-1/4� Imprint Area: 2� x 2� ea. side or 4� Wrap Weight: 100 Pcs. / 15 Lbs. 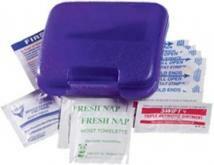 Imprinted plastic box includes reuseable forehead thermometer and usage instructions. Case Size: 3 3/4" x 1 3/16" Imprint Area: 3"W x 3/4" H Packaging Dimensions: 16"(L) X 16"(W) X 5"(H) Units Per Box: 500 Shipping Weight: 15 lbs. Includes shatter resistant high quality mirror Sewing Kit Hair Brush. 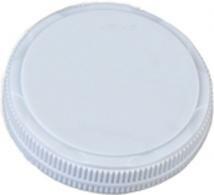 Size: 2 1/4" diameter (Round) Standard Imprint Area : 1 1/4" diameter or 1 1/2" h x 1 3/4" w. Packaging : Bulk. Shipping Weight : 100 / 14 lbs. 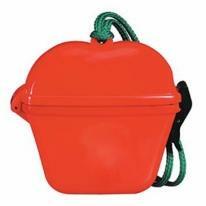 Washable and reusable Compact and convenient Great for Travel. Size: 1 1/4" w x 9" l Standard Imprint Area : 3/4" h x 3 1/2" w. Packaging : Bulk. Shipping Weight : 100 / 12 lbs. 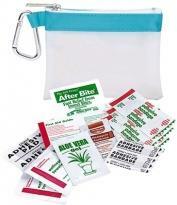 Handy wallet sized vinyl first aid kits are convenient, compact and excellent for trade show give-aways. Contains two latex-free bandages, first aid guide, non-aspirin pain reliever packet, antiseptic towelette, antacid, mini sewing kit. Case Size: 3 1/8" x 4 1/4" when closed Imprint Area: 2 1/2" x 3" Packaging Dimensions: 17"(L) X 17"(W) X 6"(H) Units Per Box: 250 Shipping Weight: 12 lbs. 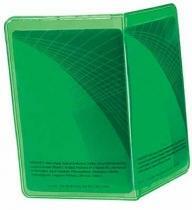 Handy wallet sized vinyl first aid kits are convenient, compact and excellent for trade show give-aways. 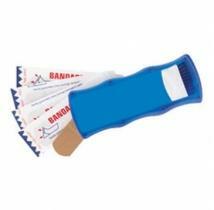 Contains two latex-free bandages, first aid guide, hand sanitizer, antiseptic towelette, mini sewing kit. Note: mini sewing kit is not made in USA. Case Size: 3 1/8" x 4 1/4" when closed Imprint Area: 2 1/2" H x 3" W Packaging Dimensions: 17"(L) X 17"(W) X 6"(H) Units Per Box: 250 Shipping Weight: 12 lbs. 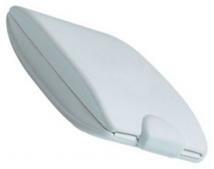 High Impact Plastic With Shatter-Resistant, High Quality Mirror. Hair Brush. Twist-Off Lid To Reveal Lint Brush. Note: Cost shown is for Colors only. Other colors available please see (Item No: 7116Silver). 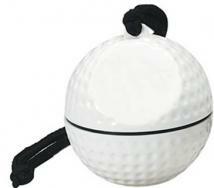 Approximate Size: 2 1/4" Diameter Imprint Area: 1 5/8" W x 1 3/8" H Packaging: Cello Bag, 250 per carton @ 35 lbs. 6 Piece Manicure Set In 2 Piece Gift Tube. Kit Includes: Manicure Scissors, Nail Clipper, Cuticle Trimmer, Nail File, Cuticle Pusher And Cuticle Shaper That Match Case Color. All Implements Are Stainless Steel. Approximate Size: 6" W x 2 1/2" H Imprint Area: 1 1/2" W x 1" H Packaging: Gift Box, 100 per carton @ 23 lbs. Contains:gauze roll, gauze tape, 2 alcohol wipes, 6 large bandages, 2 antiseptic wipes and 2 large non-adhesive pads. Size: 5" x 4 1/4" Imprint: 3 3/4" w x 2" h Packaging: Bulk. Weight: 10 lbs /100 pcs. It�s Waterproof! It Floats! It�s Impact Resistant! Size: 4-1/2� x 4� Imprint Area: 2� x 1-1/4� Shipping Weight: 100 Pcs. / 15 Lbs. Open to use one end as a lint remover & the other stainless steel end as a shoe horn. Pack/Weight: 100 PCS. / 13 LBS. Dimensions: 4"W x 1 1/2"H Imprint Size: 2 3/4"W x 1"H Packaging: Individually Boxed. The Basic Sun Kit includes : 2 Sunscreen Packets, 1 Blistex Packet, 3 Large Adhesive Bandages, 1 Antiseptic Towelette, 2 Moist Towelettes, a First Aid Guide, and applicable zipper pouch. Size: 5" x 4 1/4" Imprint: 3 3/4" w x 2" h. Packaging: Bulk. Weight: 4 lbs/100 pcs. Clip 'n Go Bag 1 Box of Color Brite Crayons 1 Doodle Pad, 5 blank pages 2 Moist Towelettes 2 Adhesive Bandages 5 Stickers. Pricing Includes: a one-color silk-screened imprint on one side of the Clip 'n Go Bag. All contents are unimprinted, inserted into the bag. Size: 4-7/8" W x 3-3/8" H Imprint Area: 3-1/2" W x 1-1/2" H on bag. Packaging: Bulk packed. Weight: Available upon request. Sportsafe : It's Waterproof! It Floats! It's Impact Resistant! Holds your keys, money, I.D., Medication, etc. Sportsball/World Globe/Racing Tire Designs Unfilled & Survival Kits. Note: To order survival kits: Order kit model number followed by desired item number suffix (i.e. Sportsafe "Football" design with neck/rope Outdoor Survivor survival kit, order Survivor-8048) (For survival kit Category model numbers and content details). Size : 3" diameter. Standard Imprint Area : 1- 3/8" diameter. Packaging : Bulk. Shipping Weight : 100 / 18 lbs. The Basic Sun Kit includes : 2 Sunscreen Packets, 1 Blistex Packet, 3 Large Adhesive Bandages, 1 Antiseptic Towelette, 2 Moist Towelettes, a First Aid Guide, and applicable zipper pouch. Size: 4 7/8" x 3 1/8" Imprint: 3 3/4" x 1 1/2" Packaging: Bulk. Weight: 4 lbs/100 pcs. 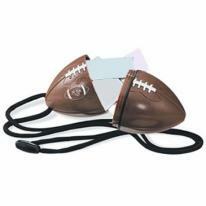 Sportsafe� "Football" Design with Neck Rope and Outdoor Survivor� Survival kit Sportsafe�: It�s Waterproof! It Floats! It�s Impact Resistant! Holds your keys, money, I.D., Medication, etc. Size: 5 1/16" l x 2 7/8" w. Standard Imprint Area: Each half: 1 5/16" h x 1 1/4" w. Standard imprint area is top half only. Other locations available; inquire. Packaging : Bulk. Shipping Weight : 100 / 16 lbs. Contains four latex-free character bandages, two triple antibiotic ointment packets, antiseptic towelette, two wash-up towelettes and a first aid guide. Product Size: 4 1/4" x 3 3/4" x 1 1/2" Imprint Area: 1 1/2" H 2 3/4" W Packaging Dimensions: 22"(L) X 16"(W) X 10"(H) Units Per Box: 125 Shipping Weight: 22 lbs. The Basic Sun Kit includes: 2 Sunscreen Packets, 1 Blistex Packet, 3 Large Adhesive Bandages, 1 Antiseptic Towelette, 2 Moist Towelettes, a First Aid Guide, and applicable zipper pouch. Add an Ibuprofen Packet to the Basic Sun Kit. Size: 5" x 4 1/4" Imprint: 3 3/4" w x 2" h Packaging: Bulk Weight: 4 lbs/100 pcs. Sportsafe : It's Waterproof! It Floats! It's Impact Resistant! Holds your keys, money, I.D., Medication, etc. Sportsball/World Globe/Racing Tire Designs Unfilled & Survival Kits. Note: To order survival kits: Order kit model number followed by desired item number suffix (i.e. Sportsafe "Football" design with neck/rope Outdoor Survivor survival kit, order Survivor-8048) (For survival kit Category model numbers and content details). Size : 3" diameter. Standard Imprint Area : 1 3/8" diameter. Packaging : Bulk. Shipping Weight : 100 / 18 lbs. Sportsafe�: It�s Waterproof! It Floats! It�s Impact Resistant! Holds your keys, money, I.D., Medication, etc. Size: 3� Diameter Imprint Area: 1-3/8� Diameter Shipping Weight: 100 Pcs. / 18 Lbs. The Basic Sun Kit includes: 2 Sunscreen Packets, 1 Blistex Packet, 3 Large Adhesive Bandages, 1 Antiseptic Towelette, 2 Moist Towelettes, a First Aid Guide, and applicable zipper pouch. Add an Ibuprofen Packet to the Basic Sun Kit. Size: 4 7/8" x 3 1/8" Imprint: 3 3/4" x 1 1/2" Packaging: Bulk. Weight: 4 lbs/100 pcs. Sportsafe : It's Waterproof! It Floats! It's Impact Resistant! Holds your keys, money, I.D., Medication, etc. Sportsball/World Globe/Racing Tire Designs Unfilled & Survival Kits. Note : To order survival kits : Order kit model number followed by desired item number suffix (i.e. Sportsafe "Football" design with neck/rope Outdoor Survivor survival kit, order Survivor) (For survival kit Category model numbers and content details). Size : 3" diameter. 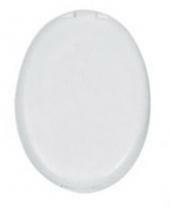 Standard Imprint Area : 1 3/8" diameter. Packaging : Bulk. Shipping Weight : 100 / 12 lbs. Clip 'n Go Bag 1 Corded Ear Plugs (Indiv. Wrapped) 2 SPF30 Sunscreen Packets 1 Moist Towelette 1 Lip Ointment Packet. 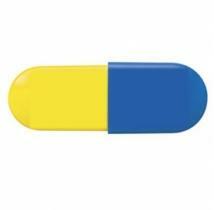 Size: 5" W x 3-3/8" H Imprint Area: 3-1/2" W x 1-1/2" H Packaging: Bulk packed. Weight: Available upon request. 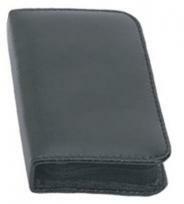 Attractive Leatherette Case With Zipper Closure. 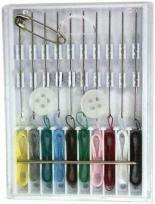 Kit Contains: 8 Spools Of Thread, Needle Threader, 5 Needles In Tube, 2 Safety Pins, 4 Buttons, Cloth Measuring Tape, Stainless Steel Nail File, Cuticle Pusher, Tweezers, Scissors, Nail Clipper And A Plastic Thimble. Approximate Size: 3" W x 5 1/2" H Imprint Area: 2" W x 3" H Packaging: Bulk, 100 per carton @ 26 lbs. 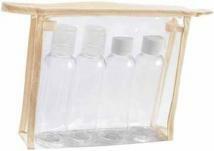 Includes: Three 3 oz bottles in a clear sealable pouch. Size : 8" x 7 3/4"
Kit Includes: 4 Refillable Plastic Bottles And 1 Funnel. TSA Approved. 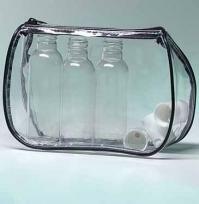 Bag: Clear Plastic with Ivory Trim. Approximate Bag size: 6 1/4" W x 5 3/4" H Imprint Area: 4" W x 3" H Packaging: 100 per carton @ 19 lbs. Clear emergency rain poncho in golf ball sportsafe Size: 3� Round Imprint Area: 1-3/8� Diameter Weight: 150 Pcs. / 28 Lbs. 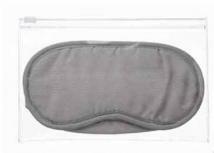 Kit Includes: Neck Pillow, Eye Mask, 4 Compressed Towels And Ear Plugs. Compressed Towel Expands To 9\" x 9\" When Wet Approximate Size: 6\" W x 6 1/2\" H Imprint Area: 3\" W x 4\" H Packaging: 100 per carton @ 34 lbs. Perfect for any overnight getaway, this pack contains everything you need to prepare yourself the next morning. The unique, single-use snap packets will really grab attention! Perfect for the travel and tourism industry. Unique, snap-open packets. Product Includes: Body wash packet, shampoo packet. Size: 3-15/16"w x 2-1/2"h x 1/2"d. Imprint Area: Front (Standard): 3"w x 2"h, 4 color(s) max |Back (Optional): 3"w x 2"h, 4 color(s) max. Packaging: Bulk Pack Of: 200 Weight: 12 lbs. Include Poncho. Available with convenient hook/clip or neck rope. Use convenient hook/clip to attach to golf bag, belt loop, fanny pack, gym/carry-all bag, knapsack, etc. to keep handy in case of rain emergency (or unexpected showers). Great for golf events, car racing/NASCAR events, baseball, football, soccer, tennis & volley ball games. 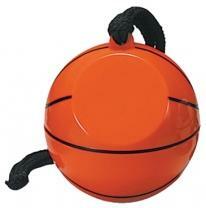 Great for colleges, schools, summer camps, concerts, tournaments and corporate events. Sportsafe: It's Waterproof! It Floats! It's Impact Resistant! Holds your keys, money, etc. Sportsball/World Globe/Racing Tire Designs with Poncho. Size : 3" diameter. Standard Imprint Area : 1 3/8" diameter. Packaging : Bulk. Shipping Weight : 100 / 22 lbs. Include Poncho. Available with convenient hook/clip or neck rope. 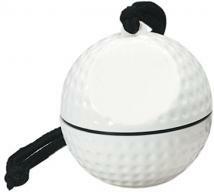 Use convenient hook/clip to attach to golf bag, belt loop, fanny pack, gym/carry-all bag, knapsack, etc. to keep handy in case of rain emergency (or unexpected showers). Great for golf events, car racing/NASCAR events, baseball, football, soccer, tennis & volley ball games. 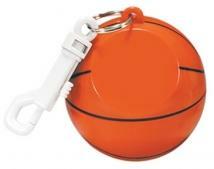 Great for colleges, schools, summer camps, concerts, tournaments and corporate events. Sportsafe : It's Waterproof! It Floats! It's Impact Resistant! Holds your keys, money, etc. Sportsball/World Globe/Racing Tire Designs with Poncho. Size : 3" diameter. Standard Imprint Area : 1 3/8" diameter. Packaging : Bulk. Shipping Weight : 100 / 22 lbs. Include Poncho. Sportsafe : It's Waterproof! It Floats! It's Impact Resistant! 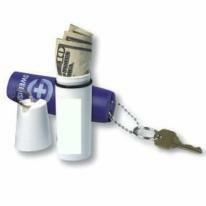 Holds your keys, money, etc Sportsball/World Globe/Racing Tire Designs with Poncho. Size : 3" diameter. Standard Imprint Area : 1 3/8" diameter. Packaging : Bulk. Shipping Weight : 100 / 22 lbs. 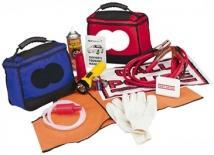 Featuring exciting colors and first aid essentials, this kit makes a practical and fun giveaway for your next promotion. The handy carabiner attached to each pouch will keep your message on hand wherever people go! Convenient carabiner to attach to almost anything Stylish pouch design in exciting colors. Materials: PVC, 70D nylon Product Includes: Includes 13 pieces: Adhesive pad, aloe packet, antibiotic ointment packet, 2 antiseptic towelettes, 4 bandages, first aid guide, insect sting relief packet, 2 snips. 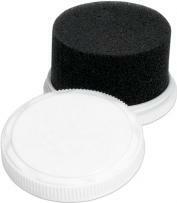 Size: 4-1/4"w X 3-1/2"h X 1/2"d. Imprint Location: Front (Standard): 2-1/2"w x 1-1/2"h, 1 color(s) max. Back (Optional): 2-1/2"w x 1-1/2"h, 1 color(s) max Packaging: Bulk Pack Of: 300 Weight: 25 lbs. Include Poncho. Available with convenient hook/clip or neck rope. 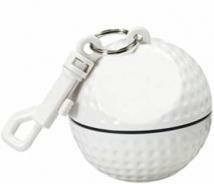 Use convenient hook/clip to attach to golf bag, belt loop, fanny pack, gym/carry-all bag, knapsack, etc. to keep handy in case of rain emergency (or unexpected showers). Great for golf events, car racing/NASCAR events, baseball, football, soccer, tennis & volley ball games. 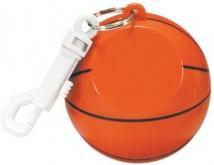 Great for colleges, schools, summer camps, concerts, tournaments and corporate events. Sportsafe : It's Waterproof! It Floats! It's Impact Resistant! Holds your keys, money, etc. Sportsball/World Globe/Racing Tire Designs with Poncho. Size : 5 1/16" l x 2 7/8" w. Standard Imprint Area : Each half: 1 5/16" h x 1 1/4" w. Packaging : Bulk. Shipping Weight : 100 / 28 lbs. 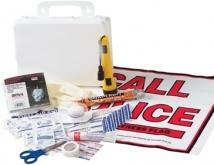 This kit is a safety essential for the home or office. Add an optional carabiner clip to the zipper pouch and make it an ideal traveling kit! Carabiner option available. Great for home, office or schools. Product Includes: CPR face shield (single use), 2 latex gloves. Size: 7-3/4"w x 4-3/4"h x 1-3/4"d. Imprint Location: Front (Standard): 5"w x 2-1/2"h, 1 color(s) max Packaging: Bulk Pack Of: 250 Weight: 24 lbs. 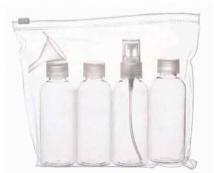 This reusable zipper bag comes complete with three empty bottles, for you to fill with your favorite shampoo, conditioner, body wash, or other travel essentials. 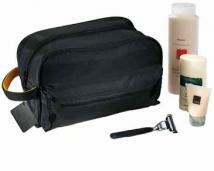 Travel with your own favorite personal hygiene products. Materials: Plastic Product Includes: 3 empty 2 oz. bottles with dispenser lids. Size : 7"w X 5"h. ImprintLocation: Front (Standard): 4"w x 3"h, 1 color(s) max |Back (Optional): 4"w x 3"h, 1 color(s) max. Packaging: Bulk Pack Of: 50 Weight: 12 lbs. The traveler's dream kit for the unexpected Zipper top closure. Amenities Include: 3 triple antibiotic ointments, 4 mini strips, 4 jumbo strips, 1 cotton-tip applicator, 1 sting wipe, 1 stretch gauze 1" x 5 yd, 6 3/4" strips, 4 antiseptic wipes, 1 adhesive tape 1/2" x 2-1/2 yd, 1 Blistex,1 first aid folder. Size: 8"W x 5"H x 2"D Imprint Area: 5"W x 3"H Product Weight: 9 lbs. per 50. Contents: 8ml Hand Sanitizer Spray, Travel Wipes, Forehead Thermometer, and Utility Pouch Colors: Blue Cap and Blue Pouch, or Red Cap and Red Pouch, or White Cap and White Pouch w/Clear and White. Imprint Areas: See Individual Item Specifications Max. Imprint Colors: 2. Addl Run Charges: $.25 Per Color. Packaging: Bulk Items per case: 50 Carton Weight: 22 lbs. Ideal for a weekend away or a short business trip, this reusable box contains all your personal care essentials. The unique, single-use snap packets will really grab attention! Perfect for the travel and tourism industry. Product Includes: 2 body wash packets, 2 conditioner. packets, 2 shampoo packets. Size: 4-1/4"w x 3-1/2"h x 1-1/4"d. Imprint Area: Top, 3-1/2"w x 1"h, 2 color(s) max. Packaging: Bulk Pack Of: 150 Weight: 21 lbs. 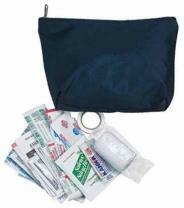 A sturdy plastic case with handle and hang-holes and waterproof gasket contains sixteen adhesive bandages, nine antiseptic towelettes, first aid cream, 1" x 4.5" conform bandage , three large adhesive bandages, first aid guide, first aid tape, scissors , flashlight (including batteries), distress flag and latex gloves. Flashlight and scissors are not USA Made. Case Size: 5 1/2" x 8 1/2" x 3 1/4" Imprint Area: 4 1/4" H x 7 1/4"W Packaging Dimensions: 18"(L) X 18"(W) X 19"(H) Units Per Box: 30 Shipping Weight: 33 lbs. The perfect gift to ensure a tranquil retreat. Kit includes: Loofa back scrubber, pumice stone, nail brush with wooden handle, mirror with wood trim and hand-held loofa sponge. 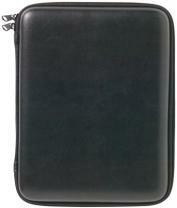 Convenient storage case with front pocket, carry strap, wooden button and PU fabric backing (Non-PVC). Fabric/Material: 600d polyester / terry cloth. Size : 10"L x 4.75"H x 3.125"W Imprint Area: Front pocket center 4W 1.5H Removable tag Center 1.125"W x 1"H. Shipping Information: Carton Size: 22"L x 11"H x 18"W Quantity: 30 Weight: 19 lbs. An array of quality products pack up perfectly in this winning Kit. Available with four 2 oz. bottles of Hand & Body Lotion, Shampoo, Conditioner, Bath & Shower Gel, Sponge & Loofah Pad. Imprinting Information: Bag: (One color imprint only) Set-up charge $45. Re-order Setup Charge $20. 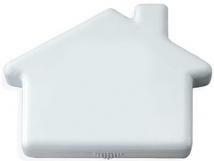 Bottle: Set-up charge $45 for printing labels 1 to 4 color process. Exact PMS color match not available for 4-color process. Reference your requested PMS colors and we will match as close as possible. Cannot imprint white on gold label. Re-order set-up charge $20. Minimum order of 250pcs to do a custom imprint on contents. Absolute Minimum Order Quantity: 25. Item Size: 8" x 5 7/8" Max Imprint Area: 4 1/2" W x 3" H Wt_100: 109 lbs. 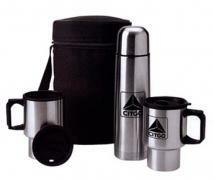 750 ml flask (F5030) cleverly packaged with two travel mugs (F5015) in 600D carrying bag. 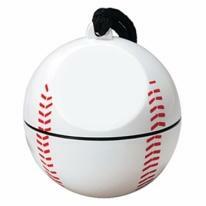 Size: 7"W x 11"H x 3.5"D Imprint Area: Mugs: 2.625"W x 2.125"H Flask: 2.625"W x 2.125"H Product Weight: 30 lbs. per 12. Bath and body kits. Spoil your favorite employees or customers with these splendid Spa Kits containing everything they need to soak away stress and feel refreshed. Translucent drawstring tote. Stock 2 oz. shampoo, hand & body lotion, and bath & shower gel. Net sponge. Loofah. Nail brush. Sponge available in white only. Imprinting: For tote bag, one color imprint only. Set up charge $45 per location. 2nd location running charge $0.50. Re-order set-up charge $20, 2nd location running charge $0.50. No less than minimum. Note: Must do a minimum of 250 kits to have a custom imprint on the pieces INSIDE the kit. Absolute Minimum Order Quantity: 25. Item Size: 4 1/4" W x 8 1/2" H Max Imprint Area: 3 1/4" W x 4 1/2" H Wt_100: 243 lbs. Packaging: Bulk packaging. Keep all your little one's precious gear stored in this stylish tote. Kit includes: PEVA Insulated bottle holder with drawstring closure, PEVA lined changing pad with black and white polka dot trim, and PU fabric backing (Non-PVC). White trim piping on front zippered flap conceals slash pockets for additional storage. Deep side pockets to store extra baby bottles (bottles not included). 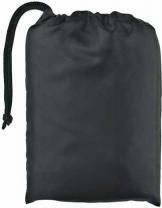 Multiple interior and exterior pockets to hold diapers, baby wipes, etc. Zippered main compartment and back pocket with Velcro closure. 48" adjustable shoulder strap with detachable buckle to secure to stroller, etc. This product is kid-friendly/CPSIA compliant. Fabric/Material: 600d polyester Size: 13.75"L X 13"H X 4.25"W Imprint Area: Top flap center 7''W x 1.5''H Front left pocket center 4''W x 4''H Front right pocket center 4''W x 4''H Shipping Information: Carton Size: 19"L x 16"H x 15"W Quantity: 15 Weight: 16 lbs. 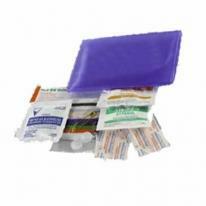 An extra large plastic case with handle and hang-holes contains twenty adhesive bandages, nine antiseptic towelettes, two gauze pads, two large bandages, first aid guide, first aid tape, 1" x 4.5 yds. conform bandage, scissors, flashlight (including batteries), glow flare, distress flag, emergency blanket and latex gloves. Flashlight and scissors are not USA Made. Case Size: 7 1/4"H x 10 1/4"W x 3" Imprint Area: 6"H x 9"W Packaging Dimensions: 30"(L) X 14"(W) X 11"(H) Units Per Box: 16 Shipping Weight: 24 lbs. 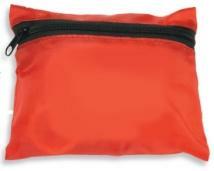 Zipper bag featuring two inner storage compartments and contains Jumper Cables (8', 10 gauge), Flashlight with batteries, Tire Inflator, emergency glowflare, distress flag, three wash-up towelettes and pocket first aid kit. Flashlight is not USA Made. Case Size: 7"H x 11 1/2"W x 6 1/2" Imprint Area: 3" H x 8"W Packaging Dimensions: 18"(L) X 18"(W) X 16"(H) Units Per Box: 10 Shipping Weight: 44 lbs. Includes 2" x 3" leather hangtag for decorating. 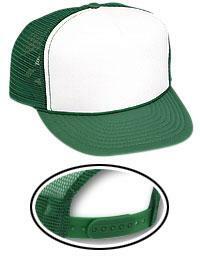 Size: 6 3/4 x 10 7/8 x 4 1/2 Weight: 6.3 oz. The ideal gift for outdoor enthusiasts, they'll never hit the trail without it. Kit includes: compass, whistle, multi-function knife, binoculars with shoulder strap, flashlight (includes AA batteries), and binocular lens cloth. Side elastic pocket keeps flashlight within easy reach. 4x30 binocular magnification. Fabric/Material: 600d polyester Size : 4.375"L x 4.25"H x 3"W Imprint Area: Front panel center 2.25"W x 1"H Shipping Information: Carton Size: 21"L x 6"H x 18"W Quantity: 25 Weight: 23 lbs. Sleek microfiber tote with attached cell phone holder; loaded with must-have business necessities in black: F728 Mini Diez Umbrella. V7342 Value Plus Journal with pen. V7822 Business Card Holder. Luggage Tag. Pricing includes 1-color imprint on tote. Bulk packaging. Size: 14"W x12"H x 5"D Imprint Area: 7.5"W x 5"H Product Weight: 35 lbs. per 25. This ultra-versatile utility case keeps you organized with multiple storage options. Metal key fob and exterior clip to hook and secure tape measure. Side Velcro pocket includes plastic container to store and organize tools and accessories, tape measure and tools not included. Molded handle grip Fabric/Material: 600d polyester. Size : 8.5"L x 15.25"H x 8.5"W. Imprint Area: (1) Front pocket center 5"W x 3"H (2) Back flap center 3"W x 1.5"H. Shipping Information: Carton Size: 24"L x 17"H x 16"W Quantity: 14 Weight: 36 lbs. Other decoration methods are available for this item, please call. Go anywhere with The Travel Adventures Highway Kit, which offers the comfort that you can handle just about any emergency situation. 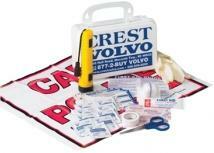 Great for camping trips, roadside emergencies, family vacations, dealership incentives. Improved thermo-plastic rubber booster cables. Product Includes: Includes 5 pieces: Booster cables (8 foot/10 gauge/200 amp), distress flag, flashlight w/2 D batteries (not inserted) and safety cone, tire inflator/sealer. Size : 11-3/4"w x 11-3/4"h x 4-1/4"d. Imprint Location: Front (Standard): 7"w x 4"h, 1 color(s) max Packaging: Bulk Pack Of: 5 Weight: 21 lbs. 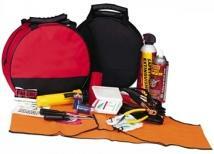 When you carry the Roadside Safety Kit, it?s like traveling with a mechanic. 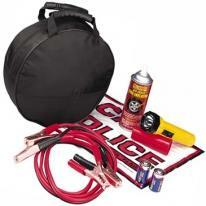 Set includes 10-gauge jumper cables, two bungee cords, gloves, flashlight (2C batteries included), rain poncho, 50 psi tire gauge, safety flag and strobe light (2 D batteries included). 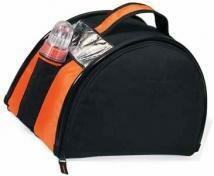 Bag features silver reflective material and strobe light for safety. Interior features multiple mesh pockets. Exterior features rugged oversized piping. Exclusive patented product. Mercury free battery. Fabric/Material: 600d polyester. Size : 14"L x 9.5"H x 9"W. Imprint Area: (1) Front pocket center 7"W x 4"H. Shipping Information: Carton Size: 22"L x 11"H x 18"W Quantity: 6 Weight: 26 lbs. Other decoration methods are available for this item, please call. This Highway Kit goes a long way in the face of a flat tire, dead battery and more, Fits nicely into its own compact, sturdy carrying case. Featuring tire tread detailing, top opening zipper and internal mesh pocket. Improved thermo-plastic rubber booster cables. Product Includes: 17 pieces: Auto touring manual, booster cables (8 foot/10 gauge/200 amp), cloth gloves, distress flag, first aid kit (8 pieces), flashlight w/2 D batteries (not inserted) and safety cone, safety vest, siphon hose, tire inflator/sealer. Size: 10"w x 8"h x 5-1/4"d. Imprint Location: Front (Standard): 8"w x 4"h, 1 color(s) max Packaging: Bulk Pack Of: 5 Weight: 30 lbs. 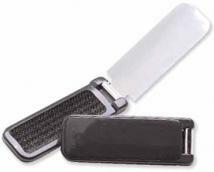 Pure luxury... Leather USB travel kit, Add a touch of class to your next promotion and impress your customers. Print Area: 2.75" x 1.57" Product Dimensions: 7.87" x 6.10" Packaging: PU pouch Weight Product: .70lb Weight Product & Box: .70lb Features: Leather USB gift set in classical style. High-end & luxurious brand image Host Interface: USB 2.0 Accessories: Retractable cable (2 pcs), mousepad, scroll mouse, 4 ports USB hub. Go anywhere with The Deluxe Cross Country Highway Kit, which offers the comfort that you can handle just about any emergency situation. Featuring tire tread detailing, top opening zipper and internal mesh pocket. Improved thermo-plastic rubber booster cables. Product Includes: Includes 28 pieces: Auto touring manual, booster cables (8 foot/10 gauge/200 amp), bungee cord, 6 clean naps, cloth gloves, distress flag, first aid kit (8 pieces), flashlight w/2 D batteries (not inserted) and safety cone, pliers, pocket road atlas, saf. 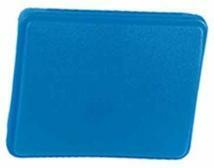 Size: 10"w x 8"h x 5-1/4"d. Imprint Location: Front (Standard): 8"w x 4"h, 1 color(s) max Packaging: Bulk Pack Of: 5 Weight: 30 lbs. 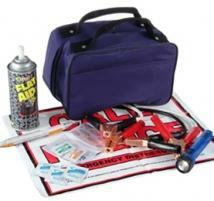 This kit features tools and resources you may need during a roadside repair or emergency, including a fire extinguisher. Comes in a great zippered carrying case. Improved thermo-plastic rubber booster cables. Product Includes: Includes 26 pieces: Auto touring manual, booster cables (8 foot/10 gauge/200 amp), 6 clean naps, distress flag, fire extinguisher, first aid guide, first aid kit (8 pieces), flashlight w/2 D batteries (not inserted) and safety cone, pliers, safety vest. Size: 11-3/4"w x 11-3/4"h x 4-1/4"d. Imprint Location: Front (Standard): 7"w x 4"h, 1 color(s) max Packaging: Bulk Pack Of: 5 Weight: 34 lbs.